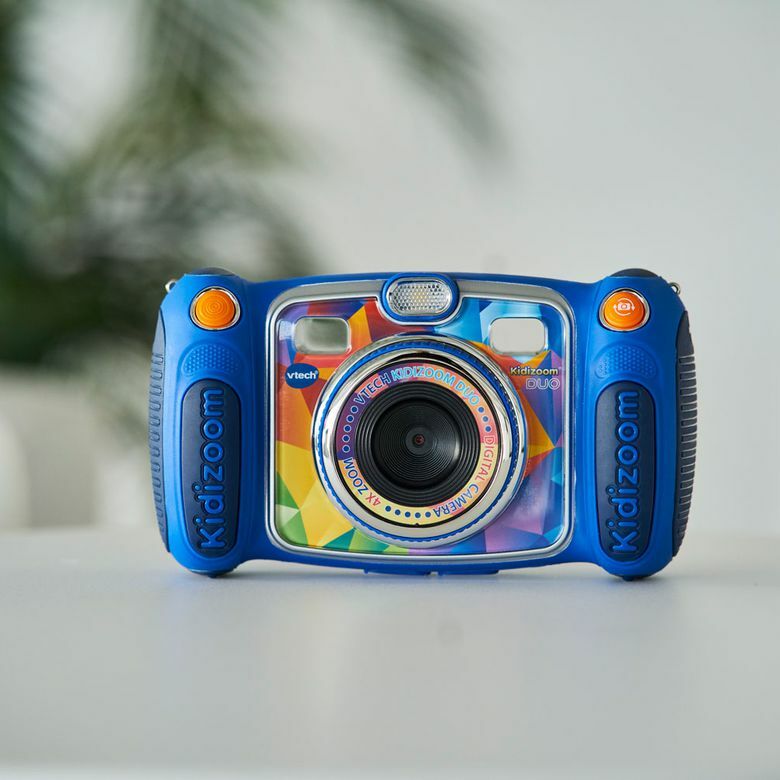 The VTech Kidizoom Duo Camera may be lacking in photo quality, but a surprising amount of features and modes are sure to offer younger kids hours of entertainment. If that’s what you’re looking for, it’s worth the buy. When we first set our eyes on the VTech Kidizoom Duo Camera, we were more than a little skeptical. But as soon as we started using the electronic children's toy and exploring its many features and modes, we realized it’s far, far more than just a camera. Kids won’t be getting best-in-class image quality or pro camera features, but we also don’t imagine they were clamoring for them. What they do get however, is a surprisingly rich multimedia experience that uses the kid-friendly camera as the jumping off point to do a whole lot more. The Kidizoom finds a fun balance between real camera features and operation, and enough filters, frames, and games to keep toddlers occupied for extended play sessions. Let’s take a look at all the hidden details that VTech put into this device to help keep kids occupied for a long time. The VTech Kidizoom Duo Camera is lightweight, fully rubberized everywhere, and clearly built to be handled by younger kids. The first thing you’ll notice when you take it out of the box is how large it is—measuring 6.4 inches wide and 3.6 inches tall. Despite the dimensions, the product itself is still very light, weighing a few ounces short of a pound. Starting from the front of the camera—you’ll find a viewfinder, comprised of two transparent plastic windows which don’t provide any actual functionality. Between these, the flash, and below them, the front camera, which contains on it something that looks like a focus ring but in actuality is used to scroll through the color filter effects in camera and video modes. On either side of the front top of the grips are two buttons, one being the shutter, and the other being the swap camera button to change between selfie and front camera modes. On the back of the camera, at the top of the device, is the rear “selfie” camera, in between the two viewfinder windows. On the right top of the grip, there is a zoom wheel which can be held down to zoom in or out when taking photos. Be aware though, there is no optical zoom capability, so this zoom feature is really just cropping in on the image, losing quality. In the middle of the camera is the 2.4-inch display, and around it, OK, Star, On/Off, Delete, Volume, and Playback buttons, as well as the home button and four-directional cursor button. The functionality of these buttons is not immediately apparent just from looking at them, so parents might want to take a minute to familiarize themselves with their purpose before getting started. Some of the buttons, like the star for example, are also very context-dependent. In photo mode, it will add effects to photos, but it is used to display the effect menu in other modes. Finally, on the bottom of the device there are two rubber flaps that reveal the USB port used for file transfer and the microSD card slot used for expanding the camera storage. Despite a wealth of functionality, the VTech Kidizoom Duo Camera requires very little in the way of setup. The camera itself is removed from the top of the packaging and comes with its four included AA batteries already inside. On the bottom of the packaging, you’ll find the camera’s wrist strap, the user guide (or “parent’s guide”, as they’ve named it), and a USB 2.0 cable for file transfer. Thankfully, the camera comes not only with a microSDHC card slot, but also with 256MB memory built in (although this memory is shared with program data, so the actual available storage will be about half that). While you will definitely want to purchase additional storage, children of parents who have neglected to do so before the product arrives will at least be able to start playing around with the product right away. When starting up the camera for the first time, a short (and loud) video will play, serving as sort of a teaser of all the functionality available to the camera. This video can be cancelled at any time by pressing the shutter button, and won’t show again after this. Next, the camera will prompt the user to set the date and time. Once these steps are out of the way, kids are free to start using the camera. We don’t imagine this will come as any great shock when we tell you that the VTech Kidizoom Duo Camera is not going to blow anyone away with its photo quality. It’s a kids toy built around camera functionality more than a camera. The front camera takes either 2 megapixel (1600x1200) or 0.3 megapixel (640x480) photos, while the rear camera takes only 0.3 megapixel photos. For those relatively unfamiliar with what those numbers mean—modern smartphones usually take photos in the 12 megapixel range, and actual digital cameras often start at around 20 megapixels even on a budget. The image size is far from the whole story when it comes to photo quality, but it’s definitely a bit of a limiting factor. Don’t expect crisp, clear, detailed photos worthy of prints. And definitely don’t expect amazing performance in low light. We have to say though, despite all these limitations, the photos that the VTech takes aren’t altogether bad-looking. The camera handled white balance pretty well and managed to get the focus right in a lot of situations where cameras tend to struggle. You won’t have any sort of manual control over the images, though, so what you get is what you get. If the photo capabilities are merely a sad story, the video capabilities are an outright tragedy. A recording resolution of 320x240 pixels (1/27th that of full HD resolution) is unheard of in this day and age, and something you might expect from a circa 2000s desktop webcam. Don’t expect crisp, clear, detailed photos worthy of prints, but despite all these limitations, the photos that the VTech takes aren’t altogether bad-looking. Recording time is also somewhat limited, allowing only five minutes using the included internal storage, and 10 minutes when using an SD card. Video was clearly not a priority when creating this camera, so if video quality is an important factor in your purchasing decision, keep this in mind. The photo and video quality sure leave something to be desired, but the opposite could easily be said about the features and modes offered by the VTech Kidizoom Duo Camera. We could hardly have predicted how jam-packed this camera is with things to do. To get started, press the Home button to go to the main menu, from here, you’ll find the overarching categories of activities: Camera, You & Me Camera, Video, Playback, Voice Recorder, Wacky Photo Shaker, Creative Tools, Games, and Settings. Photo and Video modes do exactly what you would expect, but the You & Me camera takes some getting used to. This mode prompts the user to take pictures of themselves and their friends or family sequentially, adding their faces to a group photo set in a plethora of pre-built scenes designed for 2 to 4 people. Scenes can be very simple, like a split-screen view of two photos, or elaborate, such as a group of friends huddled around a birthday cake or three ballerinas dancing. Once you’ve selected your scene and captured all your faces, just hit OK to save the picture. The voice recorder mode can record the users voice for up to 10 minutes per file. After a recording has been saved, you can press the star button to bring up the voice changing effect menu, and apply voice effects. These effects include things like raising or lowering the voice, slowing down speech, a robotic filter, and more. We could hardly have predicted how jam-packed this camera is with things to do. Next is the Wack Photo Shaker, a bizarre mode that plays all the photos on the camera in a slideshow. During this, you can shake the camera to show funny effects on each photo when prompted with the Wacky Photo Shaker icon. Pressing the star button brings up the Wacky Photo Shaker menu, letting you choose from a selection of background music, transition effects, delays, and a shuffle feature which randomizes the playback order of the slideshow. After that is Creative Tools, which contains in it another three modes: Photo Editor, Face Library, and Silly Face Detector. Photo Editor lets you add photo frames, stamps, special effects, and fantasy effects to a photo. Special Effects are things like fun house distortion or kaleidoscopic effects, while Fantasy Effects are things like snowflakes, hearts, stars, and other such overlays. The Face Library lets you choose faces from previously taken photos and apply them to a variety of scenes without having to capture the photos again. You can save a maximum of 10 faces, and add or remove faces at any time. And finally the Silly Face Detector, which prompts the user to put their face in the center of the frame and, once a face is detected, take a photo and give it a silliness score from 0 to 100%. Sadly, the results of the Silly Face Detector are generated randomly (according to VTech), although we could have sworn that we received higher scores when we distorted our faces more dramatically. After Creative Tools is Games, which lets you choose from five games built into the device: Busy Traffic, Save the Fish, Basketball Fun, Crazy Cafe, and Bounce Around. Many of these games use motion control in their operation, but prompt you to choose between using the accelerometer and using the directional pad when you first start playing. These games are also subject to parental controls, letting parents choose to limit the total amount of time playing these games in a given day. And finally, the settings menu, which contains very few options compared to a normal camera. You can set a wallpaper style for the menu, review the internal memory and memory card status, change the parental controls, and a few other bare details necessary for use and operation of the camera. At first blush, a price point around $50 seems pretty extravagant for a kid’s camera—even more so when you consider the photo and video quality. Take a closer look, though, and you realize you are getting way more than a camera. The VTech Kidizoom Duo Camera is a multimedia device and game platform that will entertain kids for about as long as their curiosity allows. When you consider the full scope of its capabilities, the price feels a little bit more appropriate. Another popular option for kids is the Ourlife Kids Waterproof Camera, an action camera that retails around $40. While also a great option, these cameras could hardly be more different. You won’t be getting any of the dozens of frames, styles, effects, and games on the Ourlife, but you will definitely be getting a device more specifically designed for photo and video use, and at a lower price point. Additionally, the Ourlife model is rechargeable, so you won't need to keep purchasing batteries over time, as you would with the Kidizoom Duo. Ultimately buyers should consider the age and interests of the kids that will be using these cameras above all else. See more reviews of our favorite cameras for kids available for purchase. A feature-packed device that takes average photos, but is a good value for the price. The VTech Kidizoom Duo Camera fits more activities, modes, and features into itself than we would reasonably expect. While it’s not the cheapest option for kids, and it doesn’t take the greatest photos, it offers a nearly endless amount of entertainment and is definitely worthy of consideration. Product Dimensions 6.4 x 3.6 x 2.3 in.